Mobile Homepage in your Language! Setting up mobile home pages for different languages is a very important part of my job here at Wikimedia. The English mobile home page has been setup for a while and it is based on CSS selectors. A couple other languages, (like Spanish) were easy to implement CSS solutions for and therefore I had gone ahead and created mobile home pages with the help of those communities. However, I am only one man and manually contacting each Wikipedia admin structure individually was taking far too long. Besides, different languages have different items on their home page! With the help of Petter Strandmark at the Swedish Wikipedia, we have come up with another method that should hopefully work better for lots of different languages: A customized mobile home page. If you want a mobile home page in your language, just send us the name of the page and I’ll wire it up. You can see this is the Swedish mobile main page and here is the corresponding specialized mobile home page on the main site. It’s one of those obvious solutions that takes way too long to come up with… but at least we have it now. Now, each community can build the mobile homepage that they are looking for and maintain it themselves with whatever content they want. If your language wants to produce a mobile home page, then open a ticket in Bugzilla that includes the URL of an already setup MainPage version and I’ll sort it out! 3 Comments on Mobile Homepage in your Language! Please update the blog post. 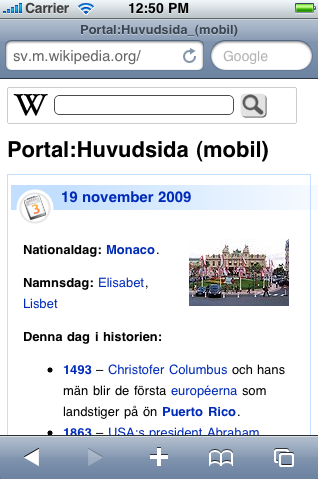 Btw, is extensions (in particular DynamicPageList) supported for wikimedia mobile now? In the past wikinews wanted a mobile page, but it didn’t work out, as our main page makes quite heavy use of the DynamicPageList extension, which wasn’t supported at the time. So is it only Swedish and Spanish you’ve implemented them for so far? Is there a full list somewhere I could keep tabs on?